I swapped tortillas for brown rice alongside this chicken fajita mixture. Taco seasoning or fajita sauces are high in sodium, so I recommend making your own spice blends and using a little oil, lemon or lime juice, and water as needed to fry the chicken and veggies. I ate this as is, but you could add toppings such as shredded cheddar, salsa, or guacamole if you like. Cook rice as per instructions and set aside. Spray skillet with canola spray, then add 1 tsp of canola oil. Set temperature to medium heat. Add onion and chicken pieces to skillet, and pour half the lemon juice and half the spices onto the chicken. Stir frequently, until chicken is fully cooked and onions have caramelized. Transfer chicken and onions to a plate and set aside. Add remaining 1 tsp of canola oil to skillet, increase heat to high, and add bell peppers. Add water as necessary while cooking. When peppers are half cooked, add zucchini slices. Pour remaining lemon juice and spices over veggies, stirring frequently. 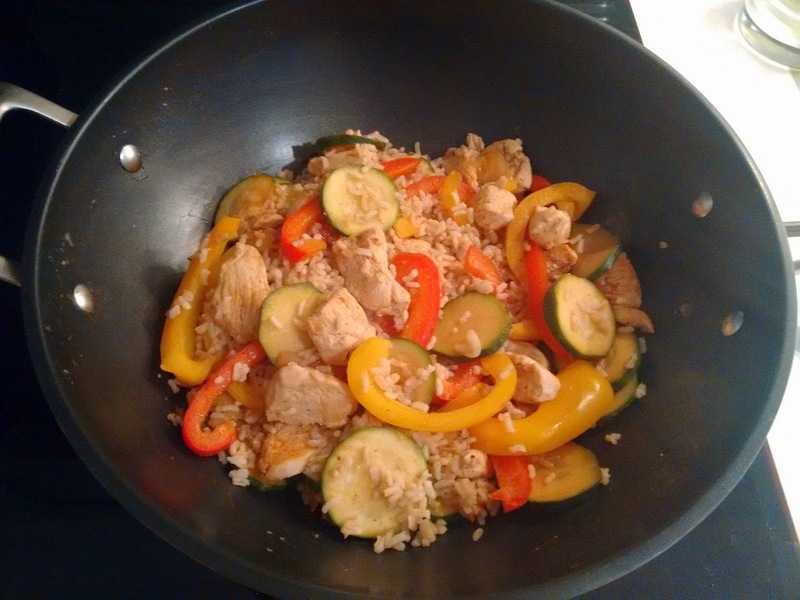 When veggies are fully cooked, add chicken, onions and rice in to skillet, and mix. Serve with fajita toppings.